One of the more memorable service animal disputes that my fellow community association attorneys at our law firm and I recall learning about was chronicled recently in a report by WPTV- NBC Channel 5 News in Palm Beach County. The station’s story had many of the most common elements found in service animal disputes: a pet owner insisting that her association must allow her to keep the family pet because the pet helps alleviate anxiety disorders, and an association that is demanding removal of the animal because it is expressly prohibited by the association’s governing documents. The key difference in this case is that Wilbur, the animal in question, is a 65 pound pot-bellied pig. The dispute is taking place in a suburban Lake Worth community, and it appears to have all of the makings for one that will be headed for litigation due to the obstinacy being displayed by both sides. The report goes on to explain that the association’s rules clearly state that “only common household pets” and “no livestock” are allowed in the community. It notes that lawyers representing the association said in a statement that they are trying to verify the medical conditions of the children in order to verify whether Wilbur qualifies as a service or emotional support animal. “A pot-bellied pig is not a common animal, but it’s a lot more common than you think,” says the owner. 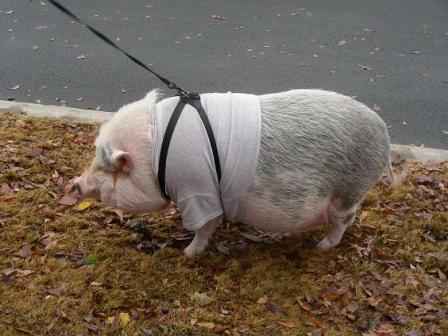 In fact, the Palm Beach County Commission has voted to no longer consider pot-bellied pigs as “livestock,” but they also decided that it would be up to specific associations to determine whether they can be allowed as pets. Pursuant to Florida’s Fair Housing Act, an association is required to make reasonable accommodations in its rules, policies, practices, or services, when such accommodations may be necessary to afford a disabled person an equal opportunity to use and enjoy a dwelling. The failure to make an accommodation when required could result in a discrimination complaint being filed against the association. However, while the Fair Housing Act requires that an association may have to allow a resident to keep what would otherwise be a prohibited pet, such pet cannot become a nuisance to other residents. It will be interesting to see how this case turns out. Both sides appear to have strong arguments to support their respective positions, and there is no doubt that it would be reasonable for a court to find that pigs are not common household pets. However, because pot bellied pigs are becoming increasingly common as pets, perhaps the time has come for associations to consider amending their governing documents to specify the types of animals that are allowed. Otherwise, they too may one day face the possibility of difficult and costly litigation to determine the outcome of a pet pig as a service animal in their community. Click here to see the report in the WPTV Channel 5 website.